After removing turkey from roasting pan, pour drippings (turkey juices and fat) into bowl or glass measuring cup, leaving brown bits in pan. Let drippings stand about 5 minutes to allow fat to rise. Skim 6 tablespoons fat from top of drippings, and return to pan; discard any remaining fat. Add enough broth or water to remaining drippings to measure 1 1/2 cups; reserve. Cook and stir mushrooms in turkey fat over medium heat, stirring constantly and scraping up brown bits, 2 to 3 minutes or until liquid has been released from mushrooms. Stir in vinegar; cook and stir 3 to 4 minutes longer or until vinegar is syrupy and clings to mushrooms. Stir in flour; remove from heat. Gradually stir in reserved drippings, cream, sage, salt and pepper. Heat to boiling, stirring constantly. Boil 2 to 3 minutes or until gravy thickens. Serve leftover gravy over wide egg noodles for a stroganoff-type side dish. 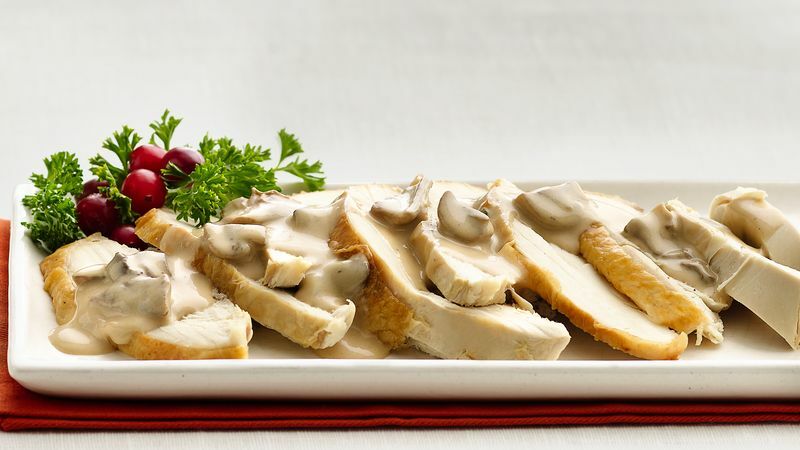 Add a splash of truffle oil just before serving to further enhance the earthy, rich flavors of this gravy.